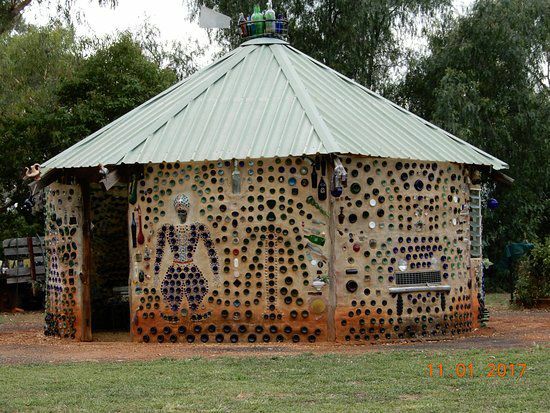 Aladdin's Cave Bottlehouse is a yurt-style building of about 3000 bottles just a seven minute drive from Dubbo. Items of interest in the bottles include messages, photos, toys, treasures and much more. There are many surprises including Genie, Harry Potter's Car, Aladdin's treasure chest and over 1000 bottles suspended inside on marine rope. In a large shed is an Australiana and heritage collectables display of old bikes, sewing machines, blacksmith tools, saddler, old pots, fans, jugs and rabbit traps. Visitors can enjoy a 'gumnut walk' to view beautiful West Australian flowering eucalypts.